Not that you need an excuse to tuck into a great bottle of Tempranillo, but we’re giving you one anyway! Today is International Tempranillo Day, a celebration of the Tempranillo grape with all its regional synonyms. TAPAS, the Tempranillo Advocates Producers and Amigos Society, has organized this day and is encouraging everyone to open a bottle of Tempranillo, enjoy the fun, and share their experiences online with the hashtag #TempranilloDay or #Tempranillo. According to the group, “Tempranillo, indigenous to Spain and used in the great Rioja and Ribera del Duero wines, is planted in 500,000 acres of the world’s vineyards, making it the fourth most planted wine grape.” Visit TAPAS‘s website for a full schedule of events and celebrations. As UC Press readers well know, the perfect pairing for a glass of wine is a good book. 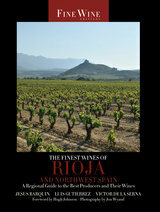 The Finest Wines of Rioja and Northwest Spain: A Regional Guide to the Best Producers and Their Wines is the quintessential guide to Spain’s most prominent wine region and its primary red wine grape, Tempranillo. Lavishly illustrated with photos and detailed maps, the guide explores winemaking from the ancient to the traditional and modern, and provides insider information on a region home to Spain’s finest Tempranillo, its prestigious Albariño, and many other indigenous grape varieties such as Garnacha, Mazuelo, and Viura. You’ll also find information not available elsewhere: “secret addresses” for the best restaurants and shops in which to find aged and historic vintages of Rioja. Salud!